On August 4, come get a up close look at dozens of specialty vehicles during Conestoga's annual Big Truck Day event. 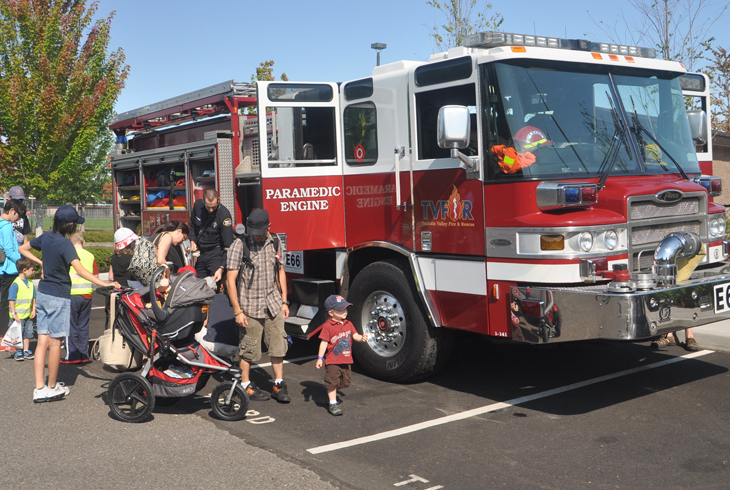 Get an up-close look at dozens of big rigs and other specialty vehicles at the 20th annual Big Truck Day at Conestoga Recreation & Aquatic Center on Saturday, August 4th, from 10 am to 2 pm. We'll provide more information as the event draws near. We are looking for volunteers to sign up for one of two shifts. 7:00 a.m. - 11:00 a.m. or 10:30 a.m. - 2:45 p.m.
Room Monitor- A variety of rooms at the rec center will be designated as a movie room, indoor playpark and a hospitality room. Volunteers in this role will supervise the room making sure equipment is being used appopriately, they may also take lunches out to the truck drivers. Primarily a standing indoor role. Parking Monitor- Assist patrons in parking, letting them know where to park and which lots are full. As well as directing them to the event. Exclusively standing/outside role. If you are a new THPRD volunteer please sign up by completing the application found here.